Usually in ± disturbed sites (dry or moist) including fields, roadsides, disturbed sites, clearings and trails in forests, cultivated ground; floodplains, wetlands, open mixed forests, shores. 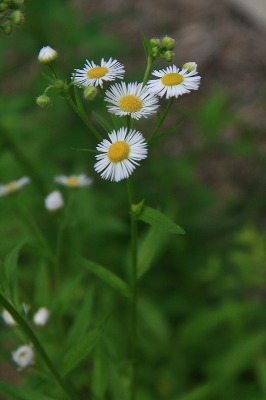 A weedy native of North America, introduced in Europe. Often a taller plant than E. strigosus, the lower and basal leaves generally toothed. The rays in both species are 0.6–1.1 mm broad, thus distinguishing them from E. philadelphicus (besides the rays being usually white, though occasionally pale pink). MICHIGAN FLORA ONLINE. A. A. Reznicek, E. G. Voss, & B. S. Walters. February 2011. University of Michigan. Web. 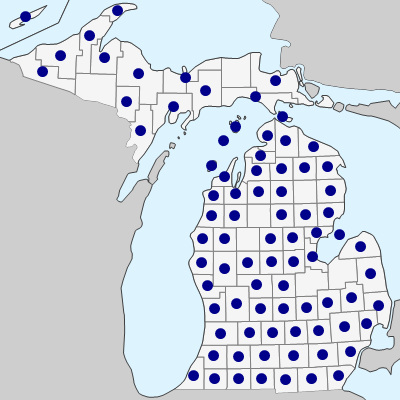 April 21, 2019. https://michiganflora.net/species.aspx?id=315.